In Graphite 1.1 we have custom (user defined) functions support. But how it works and what you can do with that? I can show you. 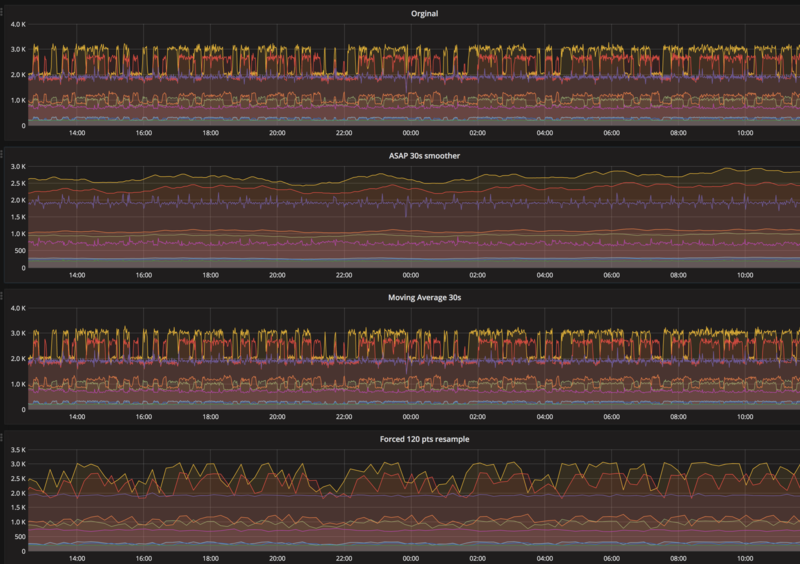 If you're watching for monitoring landscape state, you probably know about Monitorama conference. And if you watched Monitorama PDX 2017 talks you probably remember this talk from Kexin Rong, named "Automating Dashboard Displays with ASAP". Monitorama PDX 2017 - Kexin Rong from Monitorama on Vimeo. You can watch it, it's 30 minutes and quite interesting - but in short she describing new time series smoothing algorithm, named "ASAP", which smooth data as smooth as possible, but not too much. Right after this talk Wyndham "Bo" Blanton implemented ASAP as graphite-api custom function, also using Kexin's original code. That was great, but original ASAP code using "numpy" library, which is a great thing, but sometimes is too heavy to include it in your product, and original Graphite had no support for custom functions (contrary to graphite-api). This requires Graphite-web version 1.1.1 or newer and installed "numpy". For installation just copy asap.py and functions.py files to /opt/graphite/webapp/graphite/functions/custom directory and restart Graphite-web. Check output of "http:///functions?pretty=1" - function "asap()'' should be present in the output. Check Graphite's Function Plugin documentation for details.